The National League of American P​en Women (NLAPW) is a not-for-profit 501(c)(3) professional organization for women artists, composers, and writers that promotes the development of creative talents of women in the arts. Members are women who produce creative works in Arts, Letters, or Music, with over 5,000 members nation-wide. Learn more about NLAPW here. The Hawaii chapter of Sisters in Crime (SinC) welcomes you and invites you to join us. We are an organization of men and women who love to read murder mysteries, and some of us also write crime fiction. All of us encourage the publication of more women authors in the field. Read the ﻿SinC blog here﻿. Mililani Writing Group meets once a month for two hours. We're primarily focused on getting writing done, so at each meeting we chat briefly at the beginning (introduce new members, discuss what we're working on, update members about anything new), then jump right into a creative writing exercise brought by one of the members. After our writing exercise, which lasts around 20 minutes, we share what we've written. The rest of the meeting is usually devoted to quiet individual writing time that can be used to work on ongoing projects, though you can ask for more writing prompts if you'd like. Learn more. 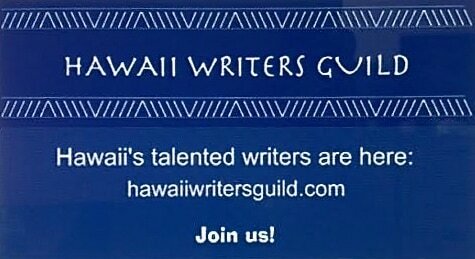 The Pacific Writers' Connection (PWC) is a Hawai'i based non-profit organization 501(C)(3) dedicated to encouraging nature and place writers, youth writing and reading programs to strengthen a network of global citizens who share concerns about their environments, communities, place, people and cultures. Find out more about The Pacific Writers' Connection here. California Writers Club Do you live to write? Write to make a living? Whether you’re a published author with a major New York house, or “just always wanted to write,” there’s a place for you at California Writers Club. We’re one of the oldest writer’s organizations in continuous operation in the nation. Read about California Writers' Club here. The Southern California Writers Association is dedicated to helping writers from all genres hone their skills and advance their careers. Members network and share vital information at meetings on the third Saturday of every month. Our mission is to foster professionalism in writing, promote networking of writers within the writing community, mentor new writers, and provide literary support for writers and the writing community through education and leadership. Henderson Writers’ Group (HWG) is a 501(c)3 non-profit organization. Our mission is to provide a networking and critiquing forum for writers of all skill levels with resources devoted to education and craft development.We hold meetings (on Mondays, Wednesdays, and Thursdays) that provide a platform for networking, critiquing, and education. In addition, the Henderson Writers’ Group hosts the annual Las Vegas Writers Conference each April. Writers of Southern Nevada is an organization of authors and wordsmiths focused on advancing the craft and business of writing through education, collaboration, networking and shared resources. Central Oregon Writers Guild's mission is to provide Central Oregon area writers a forum for mutual support and education through meetings, annual events and workshops. Our goal is to advance growth and success for individual writers of all genres and at skill levels. Founded in 2002, the Guild is a non-profit organization, where volunteers coordinate the group's activities. The Federation of British Columbia Writers has nearly 700 members in every genre, at every stage of the literary journey. It’s an organization ‘for writers, about writing’. We offer programs & events, publication venues, news, profile pages for members, promotional opportunities, and a network of dedicated colleagues for you to connect with.